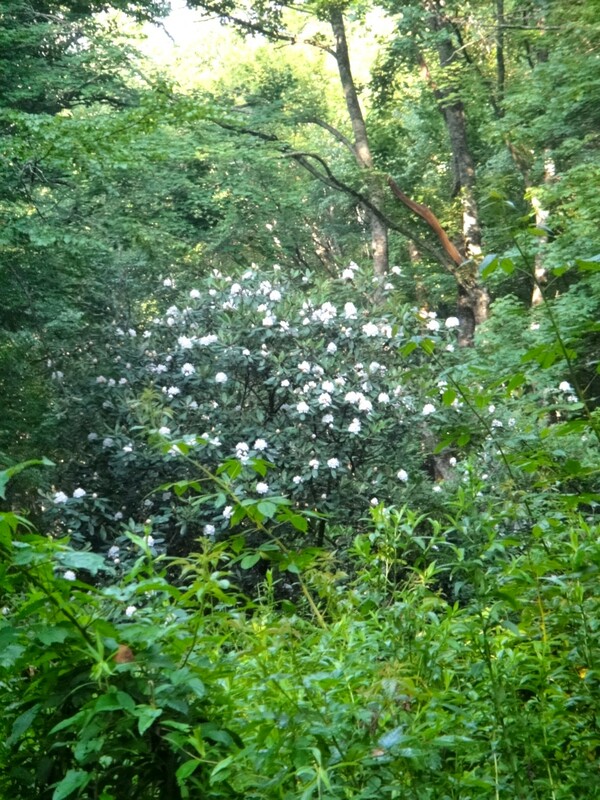 Beautiful shrub, right? It was my enemy today. Due to an unexpected change of circumstance today, I was freed from both an editorial assignment and a volunteer commitment that normally occurs on Thursdays. The editorial client decided to revise the assignment (and pay me for the work I’d already done—a nice detail), and the volunteer outfit had already told me they had an overload of help. I decided to go visit my adopted trail, the Enloe Creek trail. 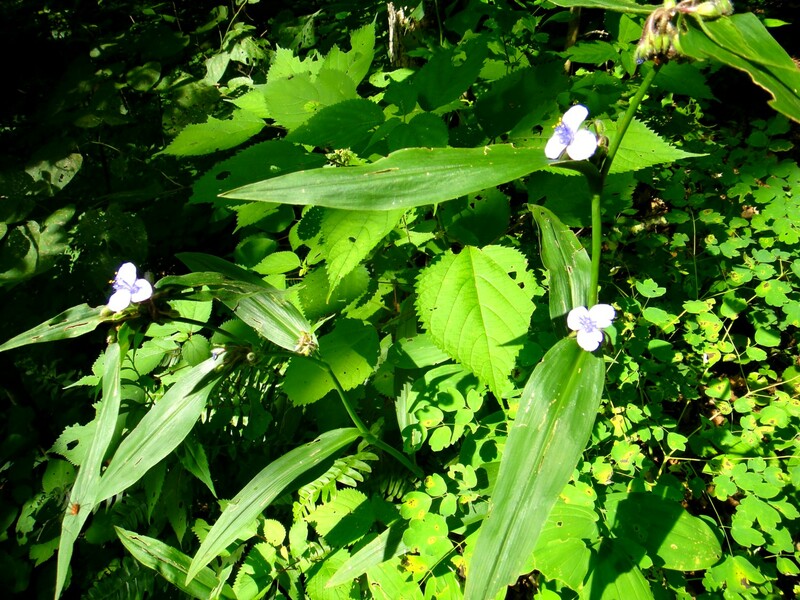 I figured it would be about time to start lopping the overgrowth that had woody stems, and then I would go back another time and hit the softer vegetation—mainly nettles—with a swingblade. At first I was not even identifying my enemy correctly. 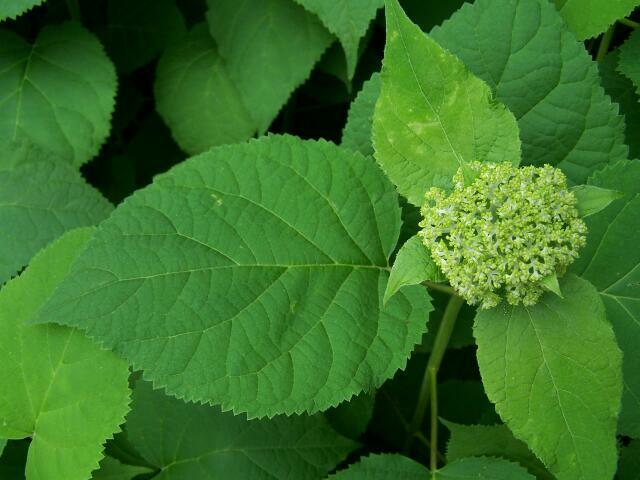 I thought it was witch hobble—Viburnum alnifolium. 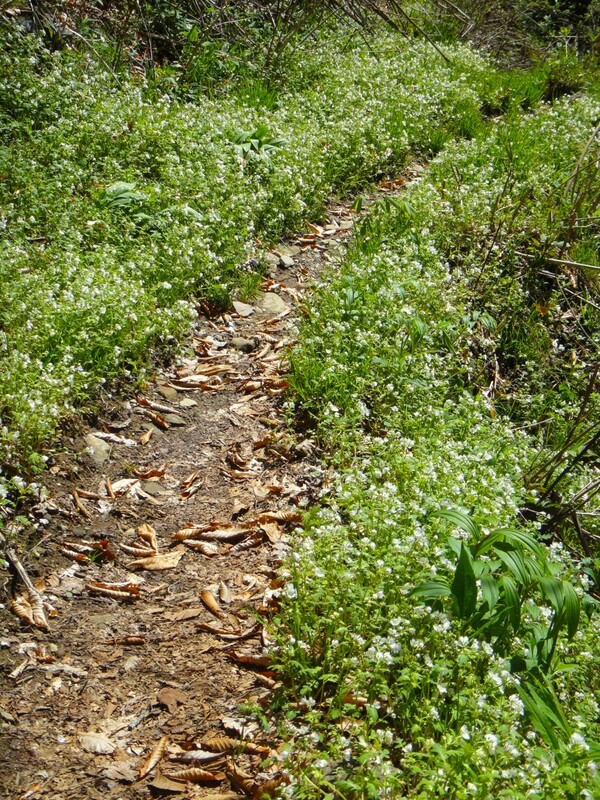 The leaves look very similar, but the flowers have a different pattern. 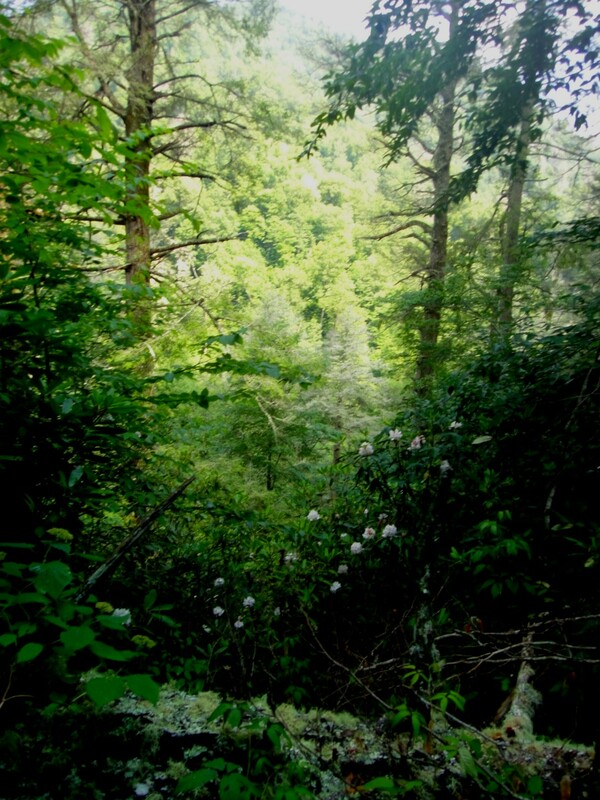 At any rate, as soon as I passed Hyatt Gap and started descending to Raven Fork, I found that these woody-stemmed shrubs were leaning out into the trail everywhere. I started lopping them, and I found that they were interwoven with rhododendron, blackberries, and greenbrier. With laurel, dog hobble, and vines of all description. 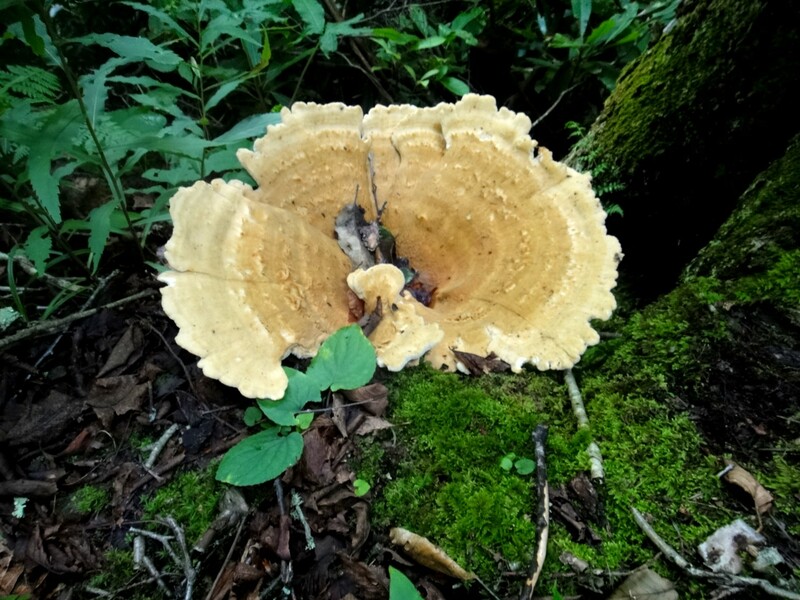 What makes it difficult is that you have to investigate very closely to find the particular stem that needs lopping, and it is usually embedded in a mass of other vegetation, like nettles, that you don’t want to grab hold of to get to the larger stem. I strained my wrist. It wasn’t from the strength required to chop through the limbs, it was from the constant twisting of the loppers as I chopped through one branch and then angled to get the next one with the heavy tool. I have weakling wrists, I think. The next time I will use a short-handled pair of pruners, much lighter. As usual, I enjoyed the rest stop at the bridge over Raven Fork. I gazed at the tapestry of vegetation that overhung the giant stream and the blooming laurel that embellished the great sandstone boulders. I think this is the most beautiful place in the Smokies. It was a hot day. I trudged on up the western portion of the Enloe Creek trail, wondering if the log bridge had been repaired (I’d notified the Park Service after an earlier work trip). Its two halves still lay forlornly submerged in the stream, but this time the water was low enough that rockhopping was possible. I continued along, as always gazing up at the wild rugged ridges around there that are crowned with red spruce. I reached the Hughes Ridge junction, the end of my trail, and turned around. As I returned to the acoustic zone of Enloe Creek itself, I decided that it has the most amazing, beautiful sound, a combination of a percussive effect—a deep rhythmic pulsing—and a melody of water. I did more lopping and recrossed the stream, returned to Raven Fork, and was pleased to find a family camping out at Backcountry Site 47. They were having a great time wading in the transparent pools of Raven Fork. From that point on, in the heat, with my diminished energy, it was hard work to climb back up to Hyatt Gap and then down to the car. When I got to the trailhead, I took a towel over to Straight Fork so that I could wash off the sweat with that nice cold water. 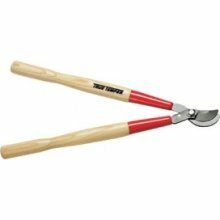 The loppers I used. They were heavy. I went out to do my first work trip of the season on my adopted trail, the Enloe Creek trail. It’s always important to deal with drainage problems early in the season, so I picked up a pulaski at the tool box with the aim of cleaning out waterbars. It was the first time I’d used a pulaski since I read The Big Burn and learned the story of the brave firefighter Ed Pulaski. So naturally I thought about him as I headed up the trail. I found myself wondering how much my pulaski weighed. 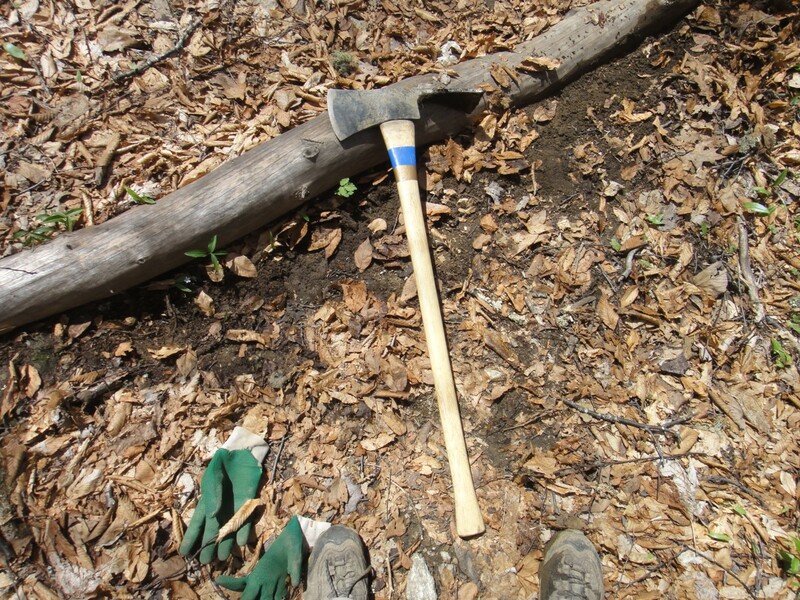 It has a 36″ handle and a hefty axe and grub hoe, and it felt pretty heavy to me. I tried to think of things with a possibly comparable weight and decide whether the pulaski weighed more or less than that. I thought of the 8-lb. free weights I use for arm exercises and decided the pulaski must be heavier than that. Then I thought of my 9-lb. cat, Lucy Meowington, and decided the pulaski must be heavier than that. I finally decided that it must weigh about 12 pounds. Well, I was way off—weigh off, you might say. When I got back home and googled some tool catalogs, I found that most pulaskis weigh about seven pounds. Time for me to do more working out with those free weights! 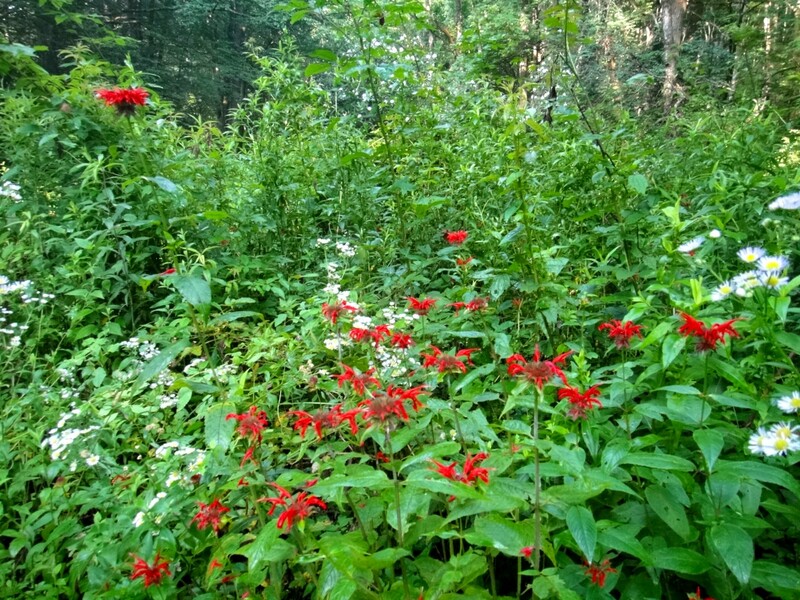 But as I climbed up to Hyatt Ridge, shifting the pulaski occasionally from one hand to the other, I enjoyed an incredible spectacle of wildflowers. 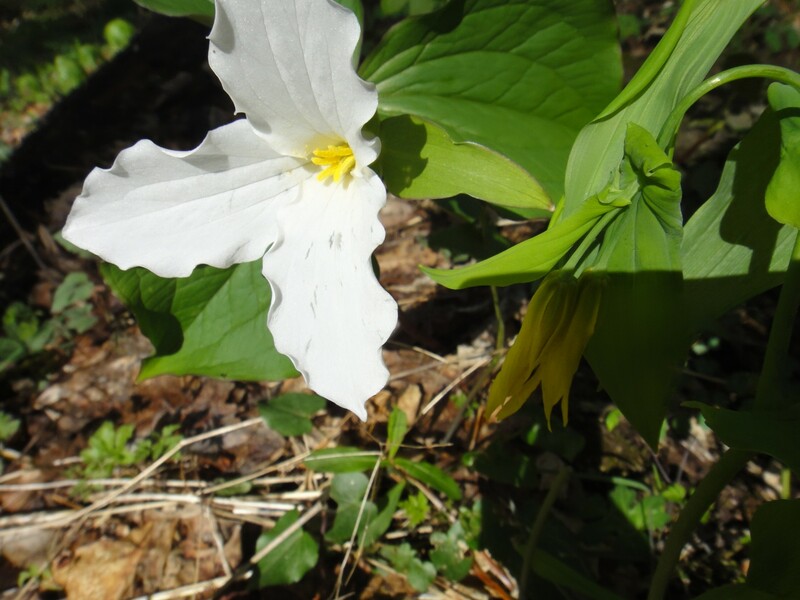 The large white trilliums were out in abundance, all kinds and colors of violets, wild geraniums, wild oats, anemones, trout lilies, spring beauties, and on and on. It was a beautiful cool, sunny spring day. 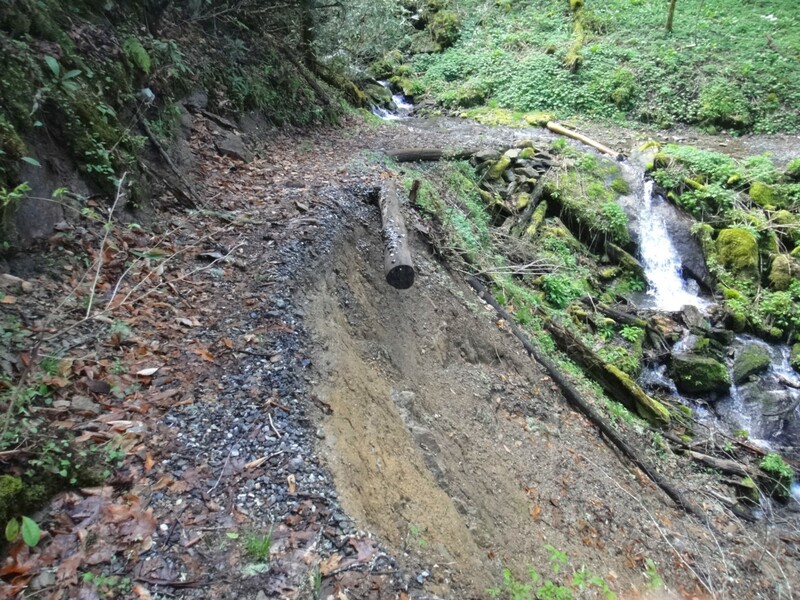 My plan was to walk to the end of the trail at Hughes Ridge, concentrating on removing small windfalls from the trail, and to clear the waterbars as I returned. I passed several blowdowns and noticed that the eroded section I reported to the Park Service last fall has gotten worse. A bit dicey for horse travel! 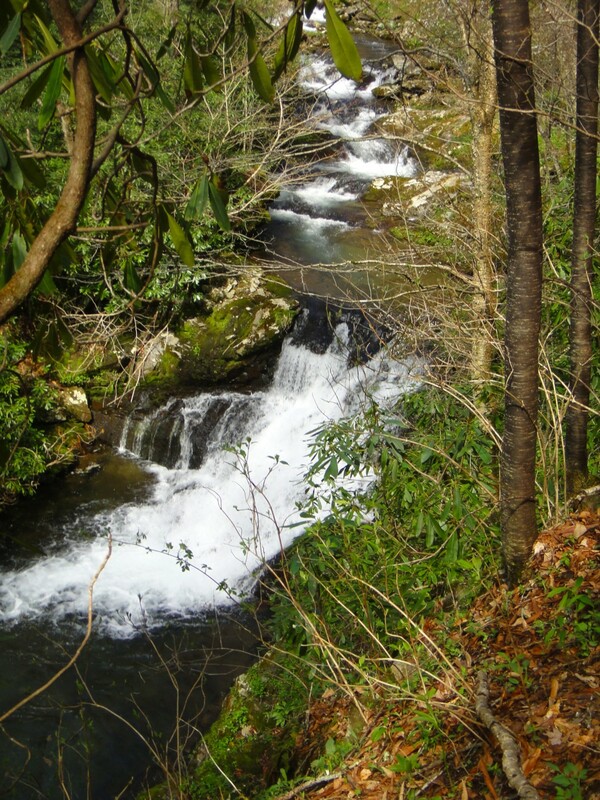 I heard the thundering of Raven Fork far before I reached it. I think I’m going to start noticing how soon below Hyatt Gap I can hear it—at which elevation. 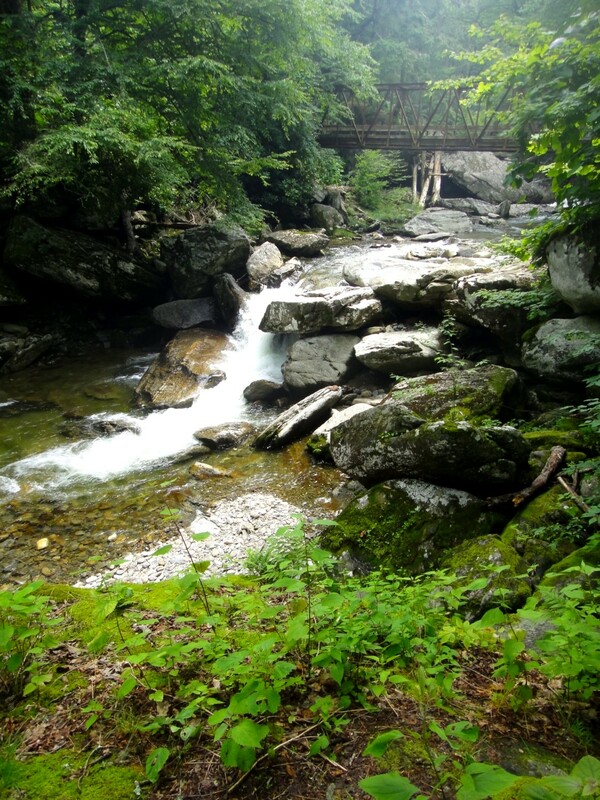 The stream was running higher than when I was here on the Hyatt Gap manway hike. 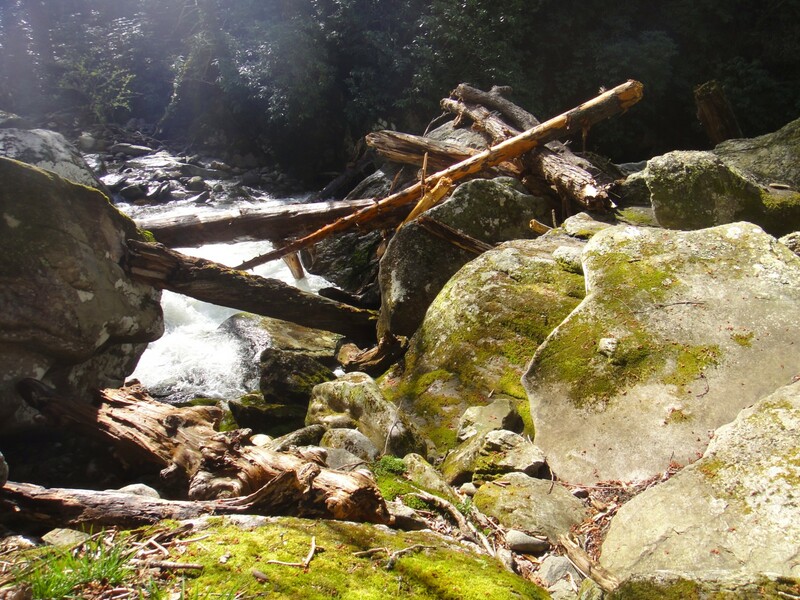 It seemed as though some new timbers had been deposited against the giant boulders above the metal bridge. After stopping for a snack at the boulders, I continued west and soon encountered a major blowdown that was pretty tough to get past. 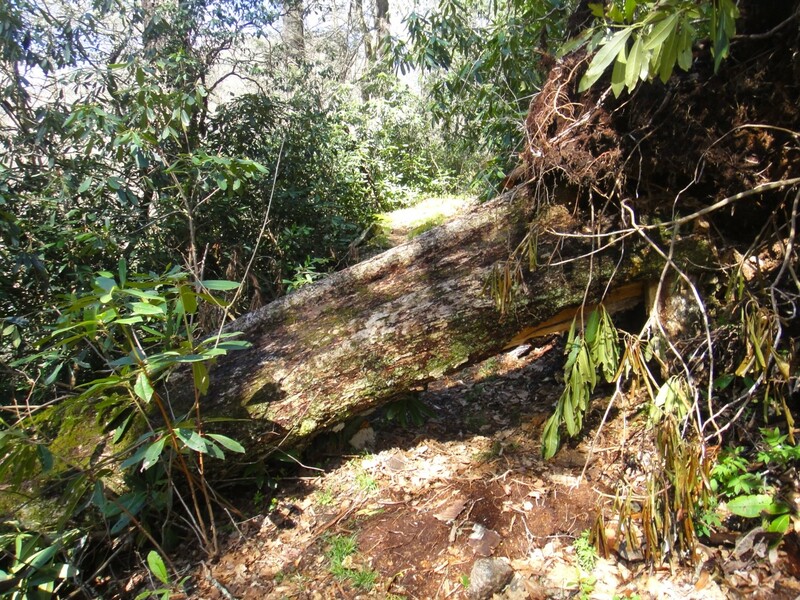 The slope above the root ball was steep and covered with rhodo, and the trunk extended way down. I just barely managed to crawl underneath on my belly. Before I reached the log bridge over Enloe Creek, I wondered whether the Park Service had repaired it. I’d reported last fall that half of it had washed away, though it had been possible then to rockhop over to the other half. The water was a lot higher now. My wondering was soon ended when I arrived to discover that not only had it not been repaired, but the other half had washed away as well. I stood there quite a long time trying to decide whether to wade across—rockhopping wouldn’t be possible. I thought of different possibilities. Use the pulaski as a hiking pole to stabilize myself in the fast current? No, it would be awkward and possibly dangerous. Find a branch to use as a pole and carry the pulaski in the other hand? Also awkward and dangerous. I finally decided not to cross. It would have been questionable even if I’d had two hiking poles and no pulaski. I consoled myself on the way back by admiring the lush borders of phacelia along the trail. 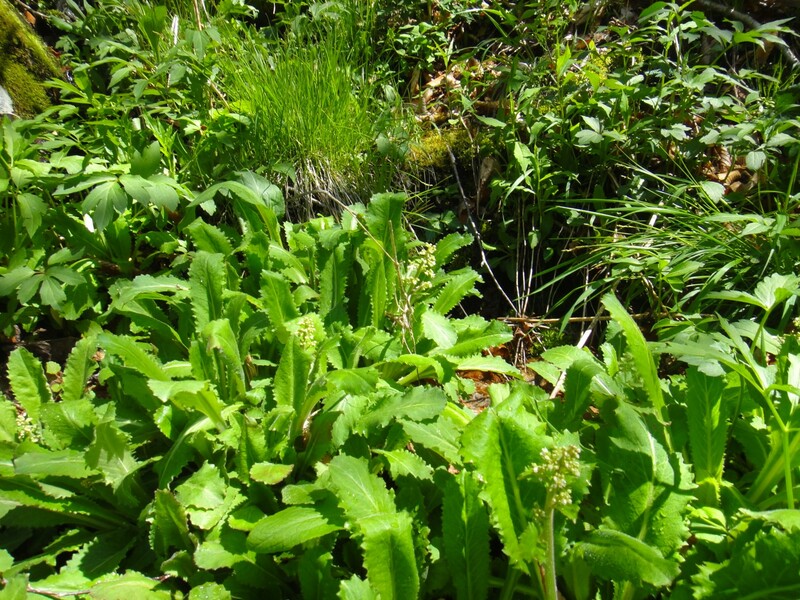 I noticed a tapestry of vegetation near a small seep. Almost all of the waterbars are between Raven Fork and Hyatt Gap. I wish I had counted them. I’m guessing there were 40, but I could be as wrong about that as I was about the weight of the pulaski. 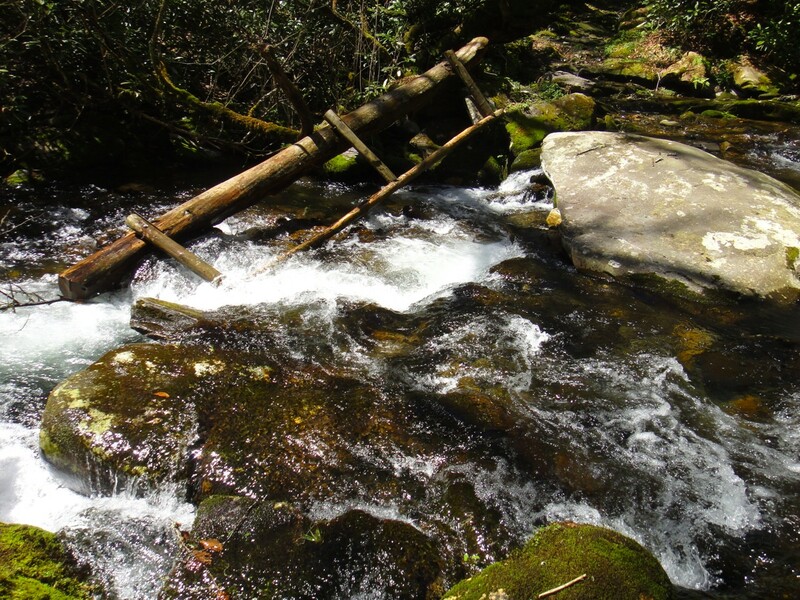 For those not familiar with waterbars, they are the low barriers made of logs or rock that divert any water flowing down the trail off to the side. This helps prevent the water from eroding the trail. Waterbars need to be cleared of any stones, soil, and leaves that have washed down and heaped up against their uphill side, and often a new drainage channel must be dug at the lower end of the waterbar. I began to realize it might have been just as well I couldn’t get to the last 1.6 miles of trail, because just dealing with those waterbars was quite a big job. I did my best to avoid hacking at the small flowers that were growing in the sediment above them. 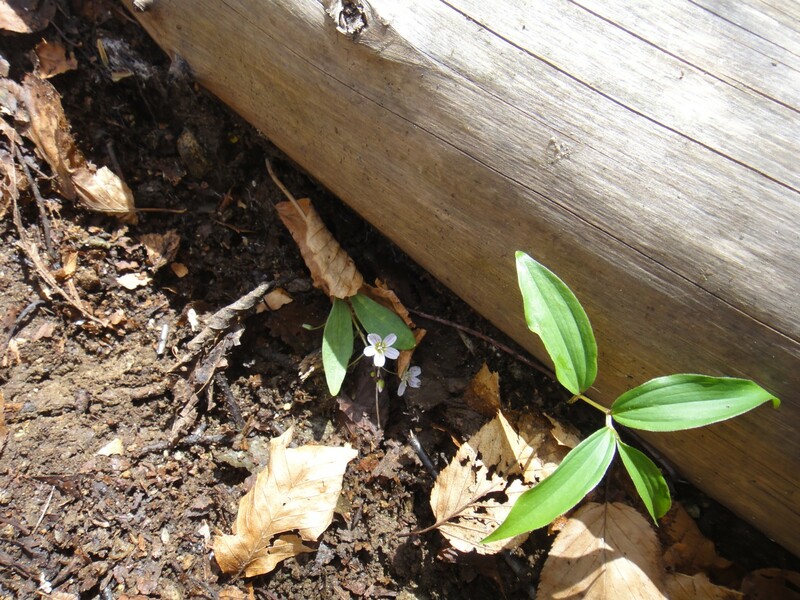 However, I was forced to trample some trout lilies in the process of improving the drainage channels. Oh well, there are plenty of them to go around. At last I reached the gap, and the end of my trail. 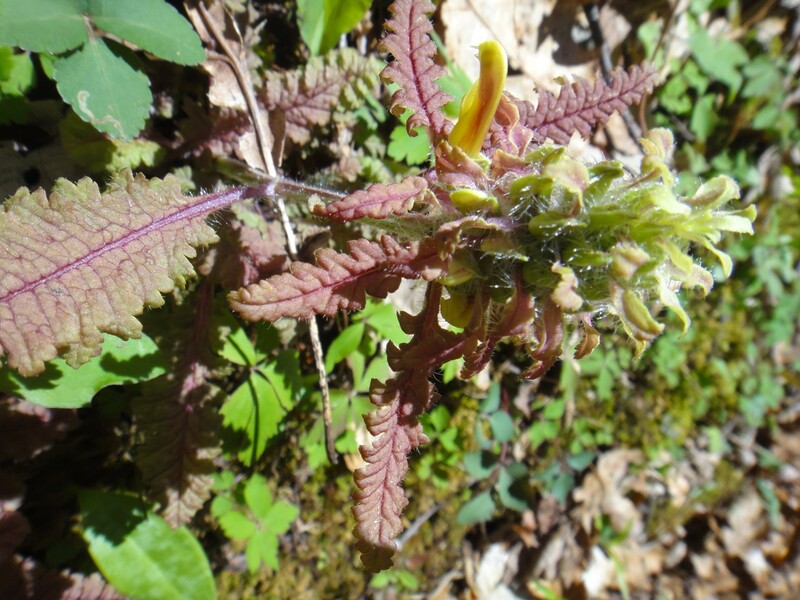 On the way down the Hyatt Ridge trail, I noticed some lousewort that was just starting to bloom. The foliage is very interesting. I was lucky to have such a beautiful day for this trip.